There’s nothing more disappointing that seeing something with such great potential never quite reach its expectations. 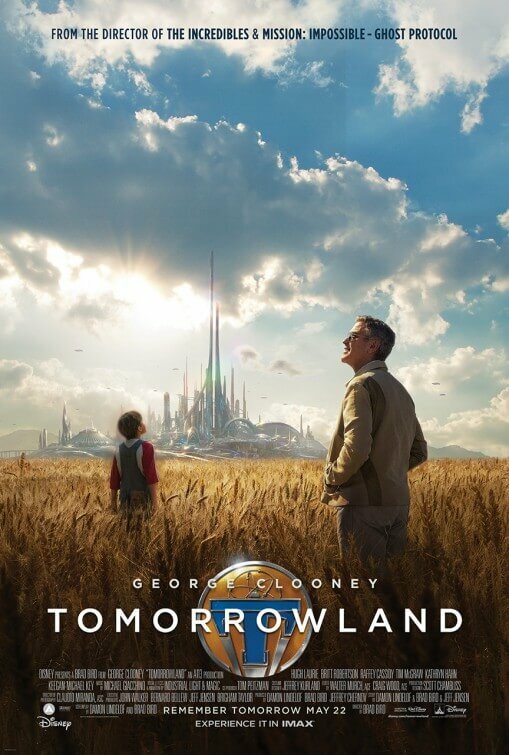 Take Tomorrowland: A World Beyond, for instance – it has a great director in Brad Bird, a talented cast with the likes of George Clooney involved, and it’s based on a section of Disneyland that actually does offer a ton of creative opportunities. Unfortunately, while these attributes look great on paper, they never form together to make a cohesive whole which, therefore, accounts as a major disappointment. That, and Damon Lindelof’s co-writing credit certainly doesn’t help. Lindelof, notorious within the internet community for contributing/ruining (take your pick) franchise films like Prometheus and Star Trek Into Darkness, as well as disappointing loyal fans of hit TV show Lost with an unsatisfactory ending, continuously likes to offer up interesting layers of mystery yet never fully follows through with them. Tomorrowland is no exception; for all its build-up and hype, it can’t help but be somewhat underwhelming when we finally get around to knowing what it’s all meant to be. Of course, nothing about it will be revealed in this review, but you’ll understand when you see it. It’s also a messy mix of two writers who both clearly have different styles but cannot seem to agree on which one to go with all the way. While Lindelof is more interested in the build-up of mystery and wonder, Bird is much more light-hearted and eager to have fun with things. When the latter shines through, the film is much more enjoyable; characters’ personalities shine through a lot more, the quirky humour is playful and sometimes very funny, and there are actually some very interesting ideas that are raised at various points. However, when Lindelof’s voice comes into play, it takes a more philosophical and talky approach which doesn’t really make things as exciting, as well as not following through with all the mystery that has been built up. It’s an unlikely Dr. Jekyll and Mr. Hyde story in the writing department, and it’s a shame they couldn’t find a way to find a more balanced way to tell this particular story. For all its clunky storytelling, it does have the advantage of being a very well-made movie. Bird, here only making his second live-action film after Mission: Impossible – Ghost Protocol, allows his love for retro futuristic environments (previously glimpsed at in his own The Iron Giant) shine through in its production design, costumes and even its sparkly cinematography by Life of Pi’s Claudio Miranda. He crafts action scenes, such as one set in the house of Clooney’s embittered inventor, with a playful tone that allows sparks of creativity to shine through, and directs some fine and likable performances out of Clooney, Britt Robertson as sparky teenager Casey and especially newcomer Raffey Cassidy as an eerily composed robot named Athena who is rightfully being named as the film’s breakout star. But sadly, despite the talents of most of the people involved, the film still falls far short of its potential thanks to its unbalanced script. It’s nothing against Bird who we’re convinced is someone who can make a flawed story such as this still look awesome, and not even Lindelof as a person because from what we’ve seen in interviews he seems like a nice enough guy, but it’s clear that these two have two very opposite voices that are each trying to make its way through as the domineering presence. It all comes to a head in its third act where the complicated nature of everything is simply too much for either to handle, and everything the film has been working towards seems to disintegrate right in front of our eyes and the result is something that, with perhaps a slight rewrite with a clear voice shining through, could have been something truly great. Instead, it’s with a very disappointing realisation that we declare Tomorrowland: A World Beyond a sorely missed opportunity. It’s definitely not bad, and when the film works it can definitely work, but just like that magical pin we’re given a glimpse of something truly awe-inspiring only to have it taken away just as soon. Tomorrowland: A World Beyond overall suffers from an unbalanced screenplay that fails to settle on either the voice of Brad Bird or Damon Lindelof, and despite Bird’s strong and lively direction it’s still his weakest film overall from a storytelling perspective, and a disappointing failure in reaching its own strong potentials.